A drone photo of the two north city water towers. The Grand Avenue Water Tower is shown in the forefront and the Bissell Street Water Tower is in the background. The Grand Avenue Water Tower, near I-70, was built in 1871. St. Louis built the Bissell Street Water Tower in 1885 to help regulate the city's water pressure. A drone photo of the Compton Hill Water Tower near I-44. Compton Hill Water Tower, shown partially completed circa 1897. Construction workers lay the brickwork for the Compton Hill Water Tower. An iron standpipe in the Compton Hill Water Tower once held thousands of gallons of water, which put pressure on the city's system and kept the water flowing steadily. Further adding to the mystery were two other giant stone towers: a red one on Bissell Street, and another on South Grand Boulevard. 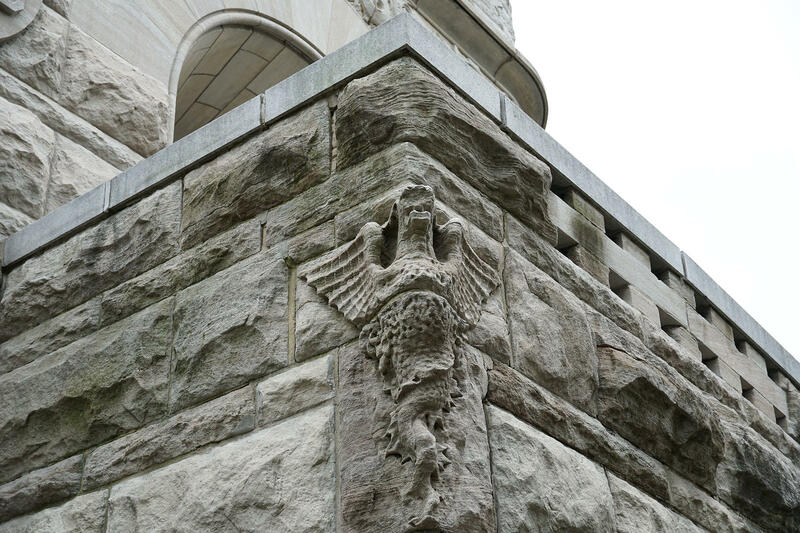 She decided to enlist our help and submitted her question to our Curious Louis reporting series: What are those stone towers scattered around St. Louis? St. Louis Public Radio reporter Shahla Farzan visited the Compton Hill Water Tower as part of our Curious Louis series. To hunt down the answer, I took a trip to the Compton Hill Water Tower on South Grand earlier this month to meet Andrew Wanko, a public historian with the Missouri History Museum. We slowly climb the 198 iron stairs that hug the edge of the brick structure. The staircase forms a dizzying spiral around a 140-foot iron tube. That tube once held thousands of gallons of water, but as Wanko explains, it wasn’t a storage tank. 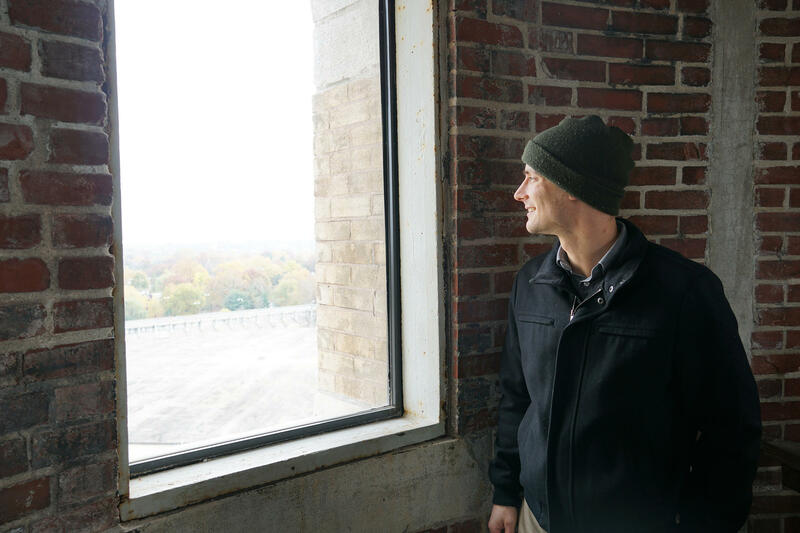 Andrew Wanko, public historian for the Missouri History Museum, stops at one of the viewing platforms in the Compton Hill Water Tower. Before the three water towers were built in the late 1800s, St. Louis had a serious problem with its water supply: there was no way to regulate the pressure. And the problem was getting worse. As the population of St. Louis swelled to more than 300,000 in the 1870s, it strained the water system. The water towers provided a simple yet elegant solution. The city built the three towers about 10 years apart, starting in 1871 with the white Corinthian column in north St. Louis that first caught Hilary Sedovic’s eye. Next came the red Bissell Street tower in 1885, followed by the Compton Hill tower in 1898. Each boasts a distinctly different style, Wanko explains, in part because they were designed by three different architects. With its delicately carved stonework and bell-shaped terracotta roof, the Compton Hill tower may be the most ornate of the three towers. It’s also the only tower in the city open to the public. Anne Jones visited the Compton Hill tower on a crisp Saturday morning earlier this month in honor of her mom, Sarah, who also loved climbing the tower. She lives a few blocks away in the Shaw neighborhood and guesses she’s probably climbed the tower at least 30 times. She brought three friends with her, including Chanel Fielder. 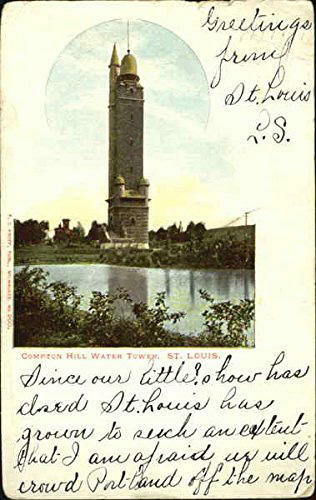 A vintage postcard of the Compton Hill Water Tower, circa 1905. Crestwood resident Vince Dieters understands the feeling. He grew up on South Broadway near Anheuser-Busch, and said he drove past the Compton Hill tower all his life but never went inside. The 78-year-old decided to climb the tower on a whim, after a construction detour rerouted him down Grand Boulevard. He stops to rest halfway up, and tilts his head back, examining the thick iron rivets along the length of the tube. Although the water towers were built to last, they quickly outlived their usefulness. As the city’s population continued to grow, the towers were unable to keep up with demand. By 1929 — less than three decades after its construction — the Compton Hill tower shut down for good. The three St. Louis water towers have been threatened with demolition multiple times in their history. 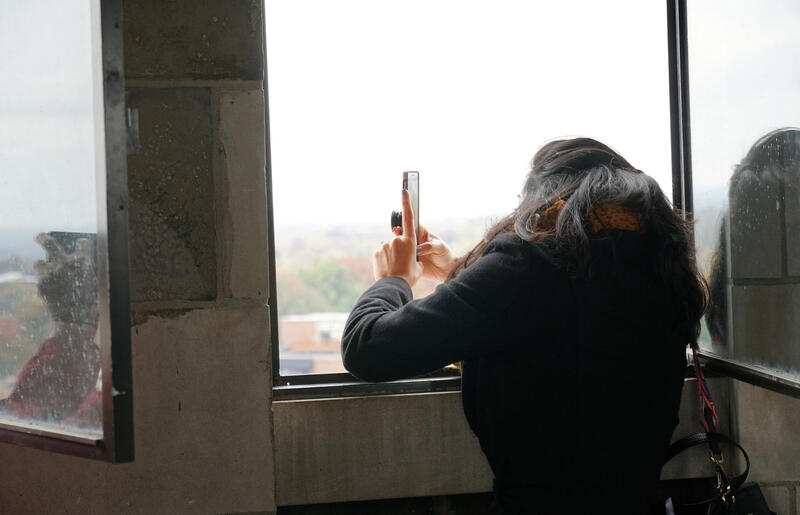 A visitor to the Compton Hill Water Tower takes a photo of the St. Louis skyline. The tower is open to the public on the first Saturday of every month from March to November. In 1972, the Compton Hill tower was added to the National Register of Historic Places. But by 1995, after years of neglect and decline, the city considered demolishing it. 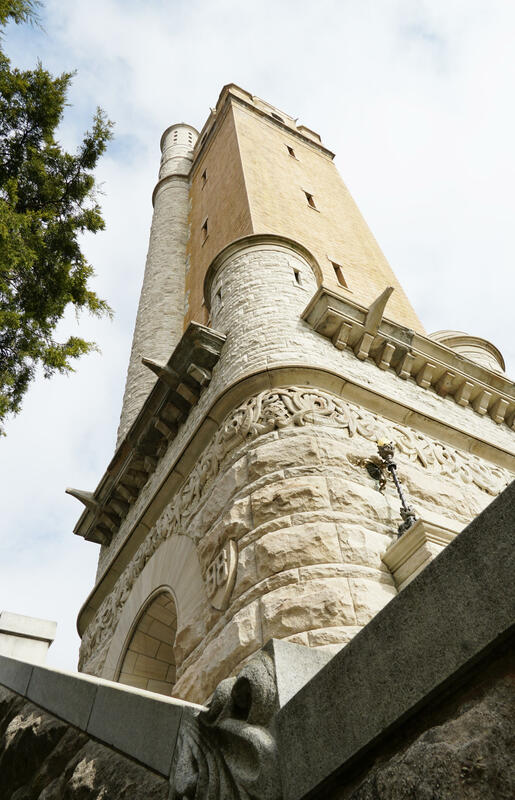 Local residents and neighborhood groups rallied to save the tower, and the city changed course, eventually completing a four-year, $19 million renovation of the tower, reservoir and park grounds. The Compton Hill Water Tower & Park Preservation Society currently has about 150 volunteers, some of which open the tower to the public on the first Saturday of each month and during the full moon. The Compton Hill Water Tower was built in 1898. No such preservation group exists for the two water towers in north St. Louis. Although Weil said there is no imminent danger of either tower collapsing, there is the possibility of masonry falling from the structures. The Landmarks Association recently hired an engineering-and-architectural firm to assess the structural integrity of the towers and map out a phased plan to restore them. The bulk of the funding for the assessment — totalling about $50,000 — came from a private foundation that wishes to remain anonymous. Once the final report is complete, the Landmarks Association will begin fundraising efforts. Weil said the surrounding community has been very supportive of the project. Where: Compton Hill Water Tower, 1700 South Grand Blvd.